This has somehow slipped under my radar. It seems like a good way to collect the otherwise scattered Hou blu-ray releases. But. . . no English subs (not unusual for Carlotta). Interesting that Cheerful Wind _hasn't_ been upgraded/released. Wonder why it got skipped over? Cheerful Wind actually got a digital remaster a few years ago (at the same time as Cute Girl) and a DCP has played at a few venues, including the San Diego Asian Film Festival and the Cinémathèque française. 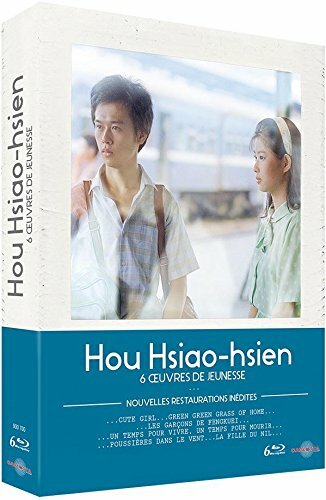 The only reason I can conceive for its exclusion from the various releases of Hou's early work (it's not in the Cinematek DVD set either) is a rights issue. Some possible circumstantial evidence for this is that there were reports in 2012 that both Cute Girl and Cheerful Wind would get theatrical reissues in Taiwan as a tribute to the then-recently-deceased Fong Fei-fei, but as far as I can tell only Cute Girl was actually released. Oh well, maybe someday... Which will we wait longer for? This ... or City of Sadness ... or Puppetmaster? It's worth remembering that Eureka will be releasing a box set containing Cute Girl, The Green Green Grass of Home, and The Boys from Fengkuei in the Spring. Why Dust in the Wind, The Time to Live and the Time to Die, and the other CMPC restorations such as Yang's Terrorisers haven't been picked up for a subbed release has continually puzzled me over the past few years. I initially assumed it was a rights issue, but whatever it is hasn't prevented them being picked up for VoD release on Amazon Prime. I wonder whether the Eureka set will be a significant upgrade of the Belgian DVD set? I was told several years ago that some of Hou's films were made with mob money. That's a ludicrous statement I know but is there any veracity to it? The only Hou film I've seen is City of Sadness and that was froma VHS tape I managed to get from a third party seller. There's just a void with Hou that isn't there with contemporaries like Edward Yang or Tsai Ming Liang. The two Era productions (A City of Sadness and The Puppetmaster) are owned by a guy who abandoned the film industry for real estate and supposedly just doesn't care about them anymore. They get occasional theatrical screenings, but these have to be authorized by Hou personally and must be purely not-for-profit. Big Ben wrote: I was told several years ago that some of Hou's films were made with mob money. That's a ludicrous statement I know but is there any veracity to it? I can't speak for Hou's films, but there's a history of the Triad's & Yakuza being involved in film production in Hong Kong & Japan respectively, so it's not unreasonable for the same to be true of Taiwan. Tweet about working on 4k restoration of The Last Movie. The three Frank Borzage silents (7th Heaven, Street Angel, Lucky Star) on Blu-ray are all out-of-print and mostly sold out, right? Amazon only has Street Angel available. Oh well, guess I missed them after years of hesitating and passing on deals. Damn shame these aren't available on BD anywhere else. Thanks for the tip, though FNAC only offers express courier shipping to Estonia, which would be way too expensive for just one item. However, I did some additional searching of my own and Potemkine had all three still available, with much more reasonable shippinng costs (~13 euros).